This industrial strength canopy shelter has been specially designed to withstand both severe weather conditions and the test of time. 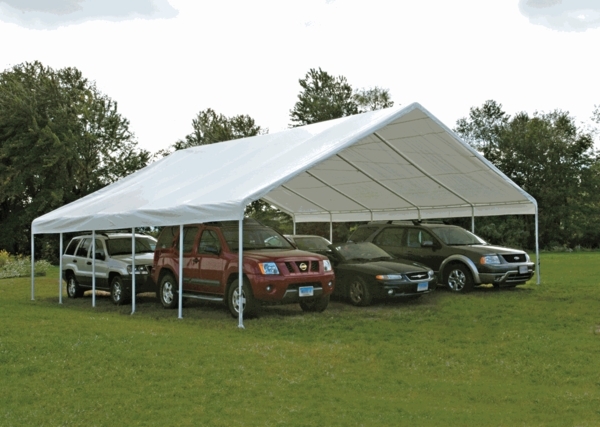 Measuring 30' wide by 30' long, features include a sturdy beam welded 2-3/8 inch diameter steel frame, an easy-slide cross rail system, wide based foot pads, a fitted on piece full valance cover, step-by-step instructions, and a 10 year warranty. The cover is made out of a triple heat bonded layer of polyethylene which has been UV treated and is totally tear resistant, and the steel frame has gone through a 13 step Rhino Shield preparation process to guard against rust, weathering, peeling, and chipping. When it comes to canopy shelters, this one is king. 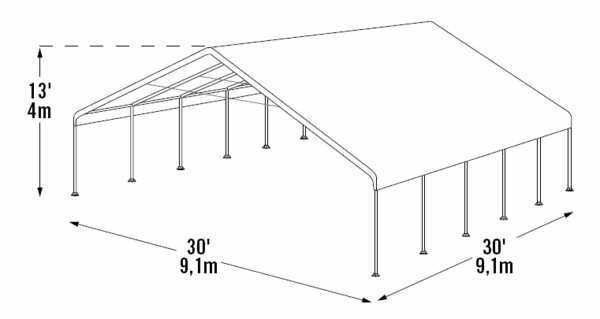 How difficult is this tent to set up? How many people do I need to set it up and how much time will we spend? Does it come with a bag or box to be stored in? I would suggest having at least two people to set up the shelter. On average, set up, could take close to 2 or 3 hours. The shelter does not come with a box or bag for storage. However it does arrive in a 4 box shipment. What is the height of the sidewalls and center of this canopy?